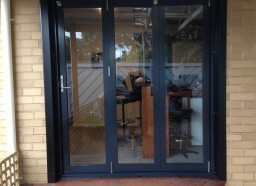 Based and operating in Melbourne’s South-Eastern suburbs, CJ & JM Doors offers a range of quality door installation and repair services at competitive prices. Our range includes timber door options, coming in a variety of hardwoods. We can provide traditionally-styled or ornate timber doors in a range of door types, including sliding, bifold or French. We also supply high-calibre aluminium doors for a range of purposes. We’re experts at installing aluminium bifold doors, helping you make the most of your outdoor area by opening it up to your indoor living. Durable and easy-to-maintain, our aluminium doors make great options for a range of door styles, including security and French-styled. Committed to providing our customers with unbeatable satisfaction, we’re an easy call away for booking an appointment or consultation. Reach us on 03 9764 4742 and see what CJ & JM Doors can do for you.